Our Motto is "We love microchips - that's why we boil them in acid" - we love what we do regardless on whether we get paid, and results are kept open source under permissive "CC BY 3.0" license to benefit as many as possible. I guess you've also noticed that we do not run any advertisements on our blog - they generate way more suffering for the readers than money. Same goes for "branded" merchandise - all these t-shirts and prints leave majority of the money to middleman party. Absence of external funding meant that our budget was somewhat tight. Main microscope was Chinese one with most parts being replaced to used Olympus ones over time. We managed to improve image quality quite a bit: compare one of our first shots 3 years ago and 1 year ago. But the limits of what we can reach with our own resources are already visible and every next step is much more expensive than any previous ones. This is where you can help us move forward if you find our work interesting. We are not going to make a living out of the blog. Any funding from our Patreon campaign or direct donations will go exclusively to equipment upgrades and to get more interesting chips for decapsulation - all to get higher-quality content to our readers, as always, open source. We always appreciate anyone reposting our photographs and articles with a link back to us. Feel free to use our materials for any educational, work and fun activities. The more people read us - the warmer feeling we get when heating up the acid. 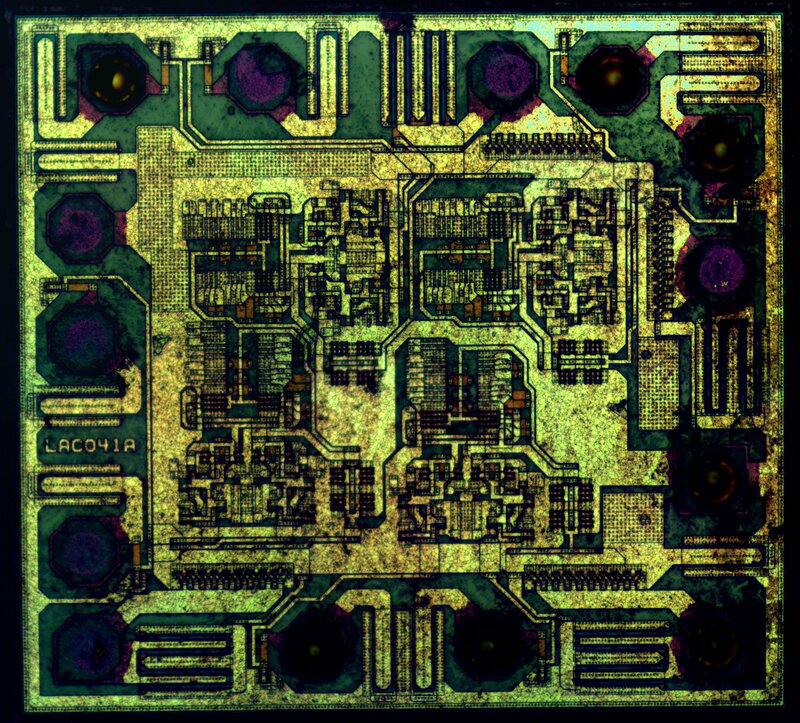 Patreon allows you to schedule small donation every time we publish new die shot. We aim to publish about 4 dies per month. Some "pledge levels" also offer few extra perks for the Patrons. You can always cancel your pledge or set specific monthly maximum. Our compaign is here. We are grateful to our current and past Patreon supporters: Adam Mayer, Josh Bluett, Game Preservation Society, Richi, Michael Zappe, Charles Lohr, Michalis Pappas, Project 54/74, Michael Steil, Robert W Miller, MaximusPsychosis, D J Capelis, Full Name, Nurelin, furrtek, Erwin Kooi, John Murray, DeuxVis, John Peterson, Eugene Sandulenko, Andrey Alekseenko, Kean Maizels, Artem V, Mikhail Sokolov, Mikkel Green, Vladislav Knyazkov, Graham Sutherland, Matt Jones, DextersLab2013, Anastasia, Kent Lundberg, Thomas, Joan Montserrat, Tomáš Mládek, Robert Perry, John Rehwinkel, Gabriel N, JP Burke, Evgeny Boger, Tomáš Franke, Brian, Martin Konečný, Oom Lout. If you represent a company - drop us a mail and we'll figure out how to allow you to support us with minimal bureaucracy and produce more interesting material for the readers (could be especially interesting if you already suffer from fake ICs...). Intel 4004 and other historical pre-1985 chips, especially "firsts" and "originals" (like original 1971 Signetics 555, TMC 1795 e.t.c). Civilian dual band GPS/GNSS (BCM47755 e.t.c). Known pairs of fake/genuine parts. Leakage-hardened parts (200°C Silicon e.t.c). Non-silicon products (SiC, GaN, diamond e.t.c). Tiny/advanced packages (SOT23-6, DFN, QFN and smaller, chip-scale packages). Chips in plastic package typically require 2 pieces minimum, for metal-ceramic package 1 piece is often enough. They don't need to be operational. Static-zapped/desoldered chips look exactly the same as good ones. Please send us email afterwards with tracking number, short description and how should we mention you in the article once it is ready (active links are also accepted).